Canadians have been given five extra days to file their 2014 income tax returns, thanks to a "human error" at the Canada Revenue Agency. 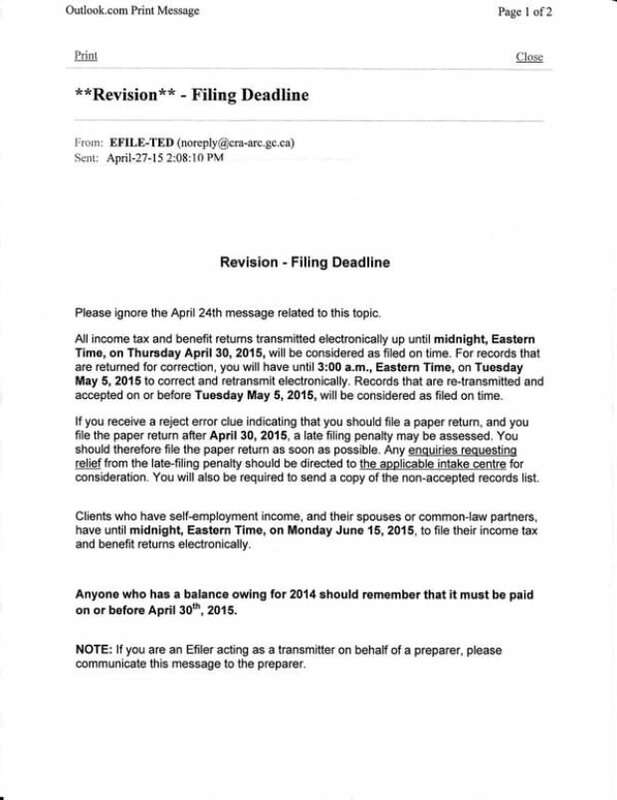 Last Friday, the CRA issued a statement saying the deadline for filing tax returns electronically was May 5 at 3 a.m.
That was a mistake. On Monday, the agency issued a new statement, saying this year's deadline is, in fact, April 30. But the damage was done. Too many people — from individual tax filers to tax accounting professionals — saw the first release, assumed it was correct and adjusted their efforts accordingly. The deadline is April 30 every year. But it has been extended under exceptional circumstances, like last year's security breach at the agency, or an issue with the CRA website in 2008 that saw users of Netfile tax software unable to submit their returns in time. "Minister Findlay has made it clear that this incorrect information is unacceptable and therefore she has directed her officials to ensure no Canadians are penalized for the CRA's error‎," he wrote. "Canadians who file their taxes before ‎May 5th will not face any penalty." It is not yet known how the error slipped through, or who procrastinators across Canada have to thank for the brief reprieve. Create more informative articles just like this one. I will bookmark this page. Goodluck.